Generally, presentation folder will seem like a normal folder used for carrying handouts, brochures, printed mails, business cards and stuff that are of officially significant to the company. Don’t underestimate the value of these folders; they are one of the most powerful medium to promote your business. It opens an entire new world of possibilities and opportunities. It will help you get that first favorable impression even before you start your presentation. Once you are in the room, now you need to get attention fast, and the best way to do it is by customized presentation folders. It immediately draws attention to your company, logo and branding to the entire meeting. When you politely hand over beautifully designed custom printed folders in trade shows, business meetings and presentations, the receivers attitude may soon change from judgmental to interested. Numerous companies are using printed presentation folders as their first point of contact to let their customer know how they can be benefited by product and service offered by the company. They are excellent and cost efficient marketing tool that helps to get a very positive response from the receiver. You would be surprised to learn that the custom printed folders almost cost the same as the general folder from your local stationary supply company. The cost is equal, but the impact the custom printed will have on your potential customer is tremendous, so from business point of view it always good to go with them. 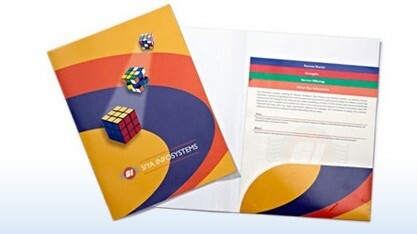 S S Graphics are the leaders when it comes to printing presentation folders. We offer our client’s premium quality folders in an array of size, shape at an affordable price. We will gladly customize it with your choice of color, font and by putting your company’s name and logo on it. Get these customized marvels today and have an upper hand over your competitors. Coated File Folders with variety of coating options. Standard finished size of the Folder is 9" x 12"
Die Cut Marks on the Bottom Pocket to hold the Business Card. Presentation Folders Printing is Easy! An attractive File folder is a unique way to make sure that your product details reach your customer’s filing cabinet and not in the trash can!Folders are great for business presentations, corporate giveaways, and when Coupled with a business card slot you can place on either pocket, these folders make sure people won't forget your brand any time soon. Folder printing is an easy, cost effective marketing technique that help the masses create your product and brand awareness. Size : Choose an Option... 9"x12" Open 12"x18"